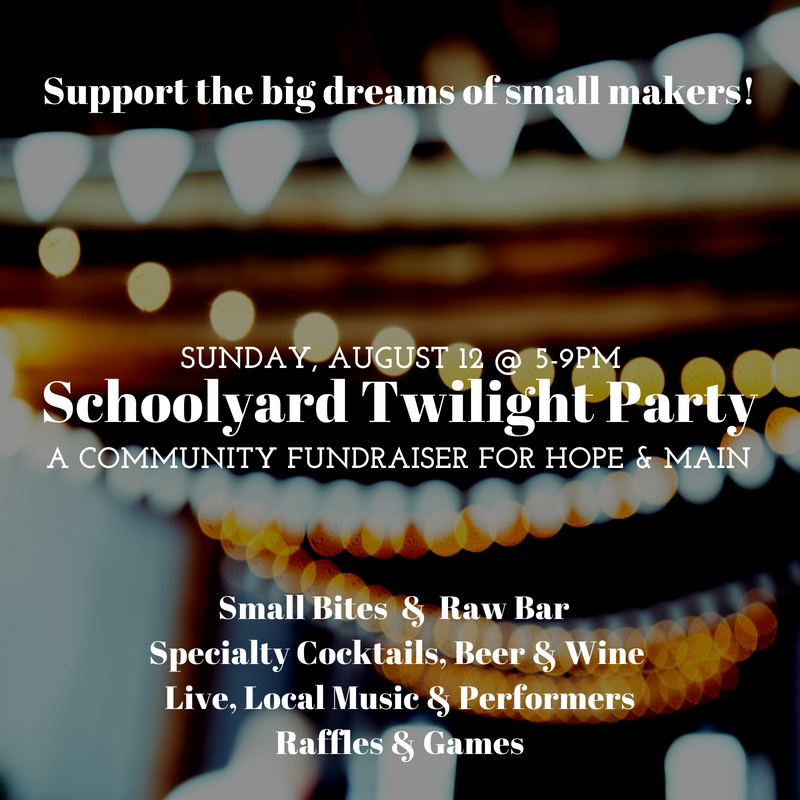 Hope & Main is pleased to announce the Schoolyard Twilight Party, a fundraiser scheduled rain or shine for Sunday, August 12 at 5pm. Proceeds from this lively family-friendly event will support the nonprofit incubator’s mission to bolster locally-based fledgling food and beverage companies, providing a comprehensive portfolio of business and educational resources. Local food fans will be delighted by a fully-stocked sweet and savory “small bites” menu prepared by a cast of more than 25 local chefs, restaurants, food trucks and product makers. Delectable eats like a Raw Bar, Mini Liege Waffles, Hot Nashville Chicken Sliders and Macaron Ice Cream sandwiches are all slated to be served throughout the evening. Rhode Island culinary legends like Chef Melissa Denmark (Gracie’s, Ellie’s Bakery), Chef Nick Rabar (Avenue N American Kitchen, The Pantry at Avenue N), and the team from local favorite, Chomp Kitchen, will be on site cooking up original dishes that cleverly incorporate Hope & Main-made ingredients. Adult tickets include a complimentary beverage at the Horizon Beverage-sponsored bar. Libations include local beer, wine, and specialty cocktails highlighting the products of Hope & Main graduates Bootblack Brand and Anna’s Kitchen. The bar will also offer Nitro Flash Brewed tea by Leafy Green, a coffee cocktail featuring Borealis Coffee, local sodas by Tito’s Brands and slushies expertly formulated by the US-based team of Switzerland’s Jungbunzlauer which utilizes Hope & Main’s commercial kitchens for research. Hope & Main stands firmly on it’s mission for food education and community engagement. The Schoolyard Twilight Party is family-friendly, featuring games appropriate for all ages and most notably a “Chopped” cooking challenge hosted by Made By Me Cooking School. Parents may register their children for participation at check in at no additional cost. Attendees will also enjoy live entertainment throughout the evening. Ease into the evening with Czesare Santana’s Latin Alternative Folk, ramp up with the rowdy Folk/Bluegrass band Hollow Turtle as the evening takes off, then rock out as twilight dawns with Otis Read and friends. Tickets are $35 for adults in advance, $45 the day-of. Tickets for kids under 12 are $10. One complimentary drink ticket is included with all adult tickets. Find more information and get tickets at www.makefoodyourbusiness.org/twilightparty or in person at Hope & Main’s weekly farmers market, Schoolyard Market on Sundays, 10am-2pm at 691 Main Street in Warren. Previous August Heats Up at Roger Williams Park Zoo! Next Featured Listing…30 First Ave. in Cumberland, RI!